14 oz, Crystal Sea Salt. Comes in a storable wide mouth glass jar. Consumer friendly, recyclable. 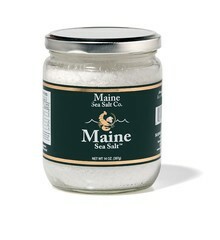 Our Natural Maine Sea Salt in a easy storage jar for the kitchen. A great value! Perfect size crystal for a grinder or salt mill. Solar evaporated and Hand Harvested on the Coast of Maine. 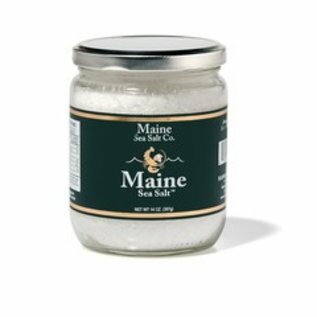 "Maine Sea Salt was founded in 1998. by Steve and Sharon Cook, Sharon is from Van Buren, Maine, and Steve, is from Bailey Island, Maine. We love food and cooking and you can't even begin without sea salt. Opening Maine Sea Salt was a natural, but not as easy as you would think. Our first product, was a 1 oz portion for cooking lobsters. The Packaging, was a hand made envelope with the salt inside and directions on the back. I took the "Maine Sea Salt for Cooking Lobster" to the area fish markets to sell. The reaction was, "are you crazy?" I begged them to try it, free, give it a couple days. It wasn't long before they started calling and asked for more. That's when I knew it would succeed. Maine Sea Salt is now located in Down East Maine in the town of Marshfield, next door to Machias, Maine. The salt works has prospered, and Maine Sea Salt is sold thru out the United States, in Health food stores, Specialty food shops, and high end restaurants. Our packaging has evolved over time, Maine Sea Salt is offered inconvenient. refillable, glass grinders, a fancy gift jar for special occasions, 14 oz wide mouth glass jar for bulk, perfect to keep in the kitchen, My newest, is a 3oz Salt Shaker, with a easy flip top lid has larger holes for easy shaking. It's great!"